The Breastest News: Harlow's 1st Birthday! My baby girl has now officially turned one! It's terrifying, she's growing too fast. I really want it to stop, pretty selfish I know but she's my little babe and I'm honestly shocked at how quickly she's growing. I'm sure it felt like her big brother took ages to turn one? Not with this cheeky girl. Harlow has rocketed through each of her milestones and continues to surprise and delight her Daddy and I each and every day. 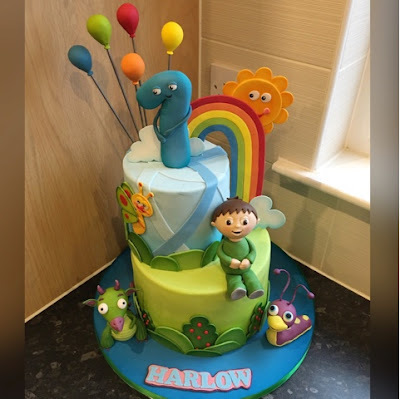 As you can see from the photo I had an awesome BabyTV cake made for Harlow's first birthday. It was made by the amazingly talented Lynne from Lynne's Cake Emporium in Kirkcaldy, Fife. I've had quite a few cakes made by Lynne and she never fails to disappoint. You should have seen the delighted look on Harlow's face when she spotted this cake being brought into the living room with everyone singing happy birthday, such a special moment. Daddy recently took Harlow to get weighed and measured etc and would you believe she's a dainty 18lbs 6oz! So tiny and still with the same cute little chicken legs she was born with. She's 74cm in height and I'm not sure if that's your average for a one year old or not? She's started to give cuddles and massive open mouthed kisses and I'm never sure if she's going to bite when she does this haha. I take my chances though as her kisses are the best. One of her favourite things at the moment is to empty the contents of my cupboards in the kitchen or the drawers from the TV unit. She's taken a massive fancy towards the PS4 controllers so her poor big brother always gets hassled when he's playing his games now. The day after her birthday she decided she'd quite like to walk more than five steps and has almost burst into a run at one point so the walking is definitely on. I'll need to get a photo of her asap with her walking milestone card. There's always so much going on I surprised even myself that I managed to get a photo with the first birthday milestone card. Let's hope I can be more organised this year! For Harlow's first birthday we had quite a busy day with family popping over in the morning to see her and give her some presents, then Logan had one of his little friends parties for an hour then we popped home to grab lunch and head into Edinburgh. We got into Edinburgh for around 4pm ish and headed straight to Camera Obscura for some family fun and we definitely weren't disappointed. One of the great things was that because we arrived later on in the day it wasn't busy and I think we were only one of two families in at the time with small children. It basically meant we could go round all 6 floors of Camera Obscura at our leisure with no rush or queuing to try anything out. It's a brilliant family place even for little ones like Harlow but be sure to put on sensible shoes as there's a few stairs to climb in this old building. 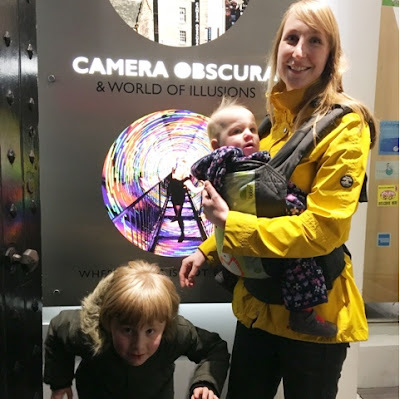 A little tip before I forget, under 5's go free to Camera Obscura and if you have a Spree book at all you get a free child (over 5) with one paying adult so you could save yourself £10.50. 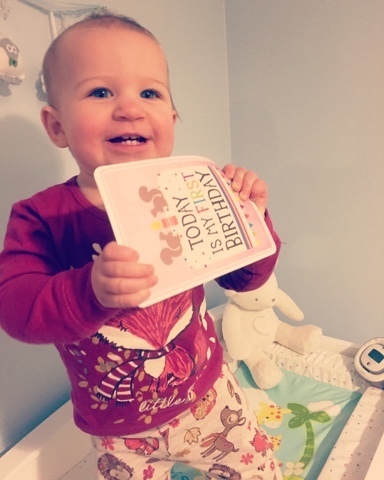 I still can't believe my little girl has turned one and I can't wait to see what she'll be getting up to this year. 2 comments on "Harlow's 1st Birthday!" Aww what a beauty! I can't believe she's one either - I remember being balled over when you typed up her being 6 months on Instagram! I'm still mooning over that cake myself so I'm sure she was more than satisfied with it :) Happy Birthday Harlow! Aww thanks Imogene. They grow far too fast, I'm practically crying myself to sleep over how fast she's growing! We're not having any more kids too so I'm treasuring every moment. Happy Blogiversary - My Blog Turns 5! Celebrating a Whole Year of Breastfeeding! 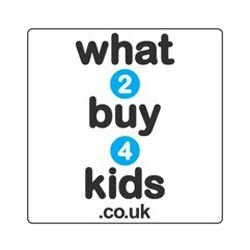 What to Buy a 1 Year Old? My Maternity Leave is Almost Over!